Our Pure Komachi 2 Stand Up Bird Shears are the perfect complement to our Pure Komachi 2 line of knives. Made with high-carbon stainless-steel blades, these blades are strong, rust-resistant and stay sharp and ready for when you need them most. Cut through tough jobs with the same ease as trimming delicate herbs. 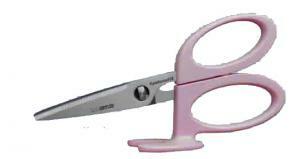 The scissor handles are made to prevent hand fatigue while providing a comfortable, non-slip grip. The perfect utility shears to have for kitchen and all around the home, the Pure Komachi 2 Stand Up Bird Shears are designed with the same quality and precision you've come to expect from Kai.